Of all the new features launched as part of Facebook Home, I think the best one was Chat Heads. It provides a notification icon that worked across all applications and allow instant access to read and reply to the party. Even if you do not use Facebook, it makes for a great alternative messaging client. Chat Heads offer the feature to message friends without having to hop in and out of a messaging app. Instead, all we need to do is click the little profile icons that float on top of the screen wherever we are, regardless of what app we’re using. Facebook has offered it as a standalone tool without the need for the full launcher replacement. 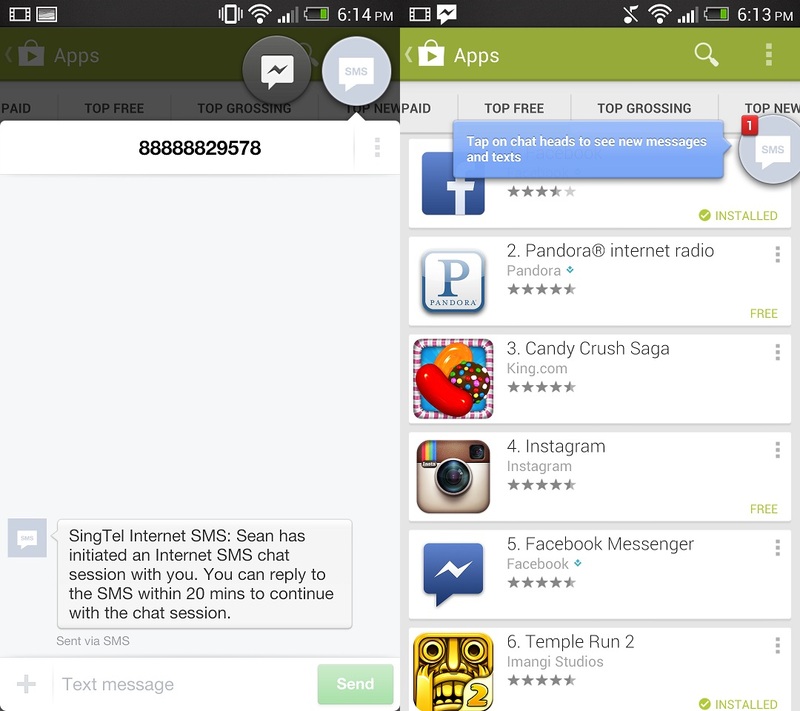 In addition, you can also incorporate your default SMS and messaging to this feature as well. This is a great step up to the standard Android messaging app. However, I tend to use Whatsapp mainly nowadays and I doubt this feature would be available anytime soon. When somebody messages you, their profile picture pops up as a small circular icon. To compose a message, it would be through the Facebook Messenger app which would offer you a choice of sending the message to the mobile number or as a Facebook message. The Facebook Messenger app interface hasn’t changed. You still get a list of all of your messages and can see who is available to chat. But once you do start messaging people, it would be through Chat Heads. The Chat Heads will follow you wherever you go, and you can place them anywhere along the right and left edge of the screen. Once you’re done, you can swipe them down to make them disappear. Also, as evident from the above screenshot, you would need to assign a contact photo otherwise the profile icon looks rather meaningless and hard for you to differentiate. I would recommend that you use Google Contacts to sync all the images, especially now that high-resolution sync is working.